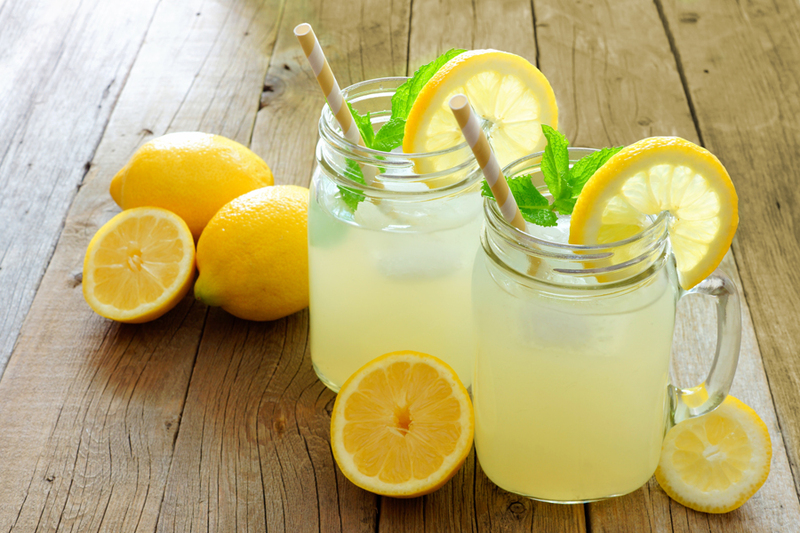 5 Easy Lemonade Recipes to Freshen Up the End of Patio Season. Lemonade is such a great base flavour that you can do almost anything with it. We’ve introduced a new lemonade product that brings the best balance of flavours, lemon’s tartness and that sweet treat taste you crave. Torani’s Real Fruit Smoothie Lemonade is made from real lemons and is an excellent way to freshen up your patio season menu. This first recipe is bound to be a nostalgic summertime favourite! It brings back the ice cream truck’s greatest product of all time – the Rocket Pop! A tri-coloured popsicle with blue and red raspberry and an electric lemonade middle. Fill a tall glass with ice and pour the Torani Strawberry Syrup into the glass to make the red layer. Blend together 8 oz of ice and 4 oz lemonade. Gently pour the lemonade over the back side of a spoon to make the white layer. In a separate container with a pour spout, mix the Torani blue raspberry syrup with sparkling water. To create the blue layer, pour the sparkling water mixture over the back side of a spoon. Add 16 oz ice, raspberry syrup, and Torani Lemonade to a blender and blend until smooth. Garnish with a few real berries. Some of our staff have gotten very good at creating awesome recipes. This one was handcrafted by Rebecca, right here in our Burnaby office. Expect this lemonade to have a cool slushy texture, and a tart black tea flavour. Staff Pick! Rebecca’s Breakfast Tea Lemonade. Makes three 16 oz servings. Brew 4 bags of English Breakfast tea in a 12 oz mug for 5-10 minutes and set aside to cool. Using a large mason jar, combine the tea and 10 oz Torani Lemonade. Top off the jar with ice and water and mix well before serving. It should be a translucent orange colour. In 2017, professional chefs are starting to see a growing trend in Hawaii-inspired menu items (like Poke!). This next lemonade recipe is a nod to the tropical oasis island of Hawaii. Add 16 oz ice, coconut syrup, and Torani Lemonade to a blender and blend until smooth. This last drink recipe combines this season’s hottest floral flavour with Torani’s Lemonade. Floral flavours on a menu are becoming a fresh staple and this is no exception. Expect a floral flavour with a hint of sweetness. Combine ingredients in a blender with 16 oz of ice. Blend together and garnish with a sprig of lavender or lemon wheel. If you’re looking for some more recipe ideas or would like to order our newest Real Fruit Smoothie Lemonade by Torani, please give your local sales representative a call at 1-888-273-8684.